The Addison Midday Rotary Flag Lease Program is an opportunity for the citizens of Addison to come together to show our national pride, foster community and support Addison and Dallas charities. Rotary International's motto is "Service Above Self." This is a service project for our club, designed to recognize those who are serving, have served, and have been lost in honor of our great nation. For just $60 a year, the Addison Midday Rotary club will place an American flag in your yard on 5 special national holidays. 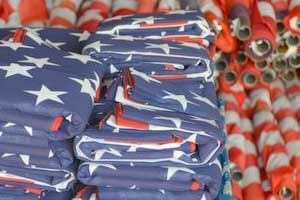 These flags will be set out the weekend before the holiday and will remain out until they are picked up the weekend after the holiday except for Labor Day, when they will remain in place until after 9/11. Stand shoulder to shoulder with your fellow Addison residents as we show our neighbors that the spirit of America is alive and well in the Addison community. Sign up Today! Why Use the Addison Midday Rotary Flag Program? Our site gives you a safe and secure way to register and pay online. We will send you an email prior to bringing your flag and after pick up. 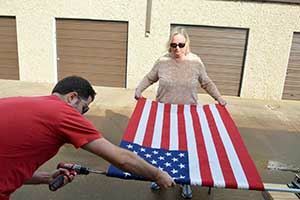 Our program makes it easy to be patriotic without worrying about putting out, storing and repairing the flag!